Summer’s coming! Stay elegant in this scorching hot season with Jessica Magazine’s cover mount gift. They are now offering a studded clutch this summer simply by purchasing their magazine at any Circle K store found in Hong Kong. 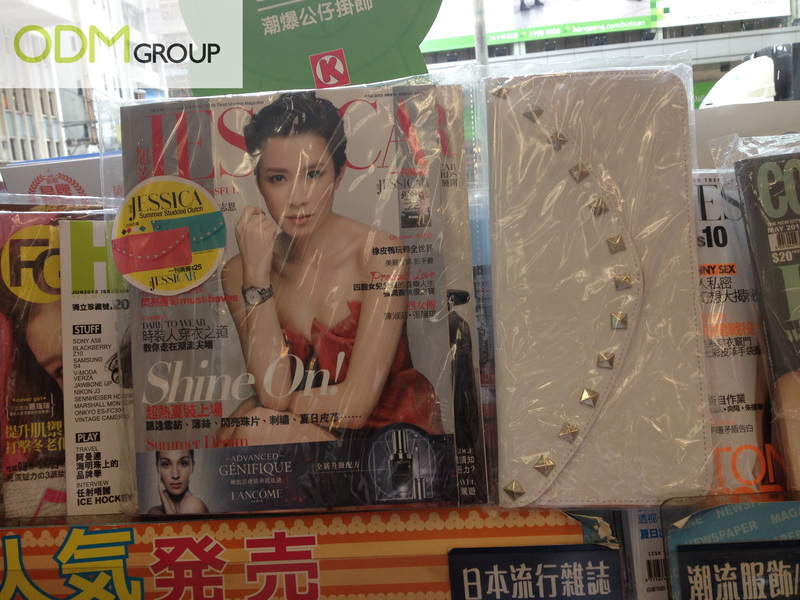 Spend only HKD$25 to receive the magazine and the clutch! Hurry down and grab this elegant clutch before it runs out of stock! Take a look at the cover mount gift offered by Jessica Magazine this Summer! Jessica Magazine is offering this studded clutch as their magazine cover mount gifts to attract people to purchase their magazines. With promotional gifts offered along with their magazine, people would be enticed to make purchases. They may even be willing to spend on these magazines in order to receive the clutch even though they may not be interested in the magazine. This would result in sales being boosted hence increasing their profits greatly. Studs would never go out of trend. Dazzling studs along with an elegant-looking clutch would definitely be able to attract much attention to this cover mount. A clutch is very useful and yet good-looking. People can simply carry this clutch even for a short walk or even as a manual fan to fan themselves in this scorching hot summer! Offering promotional gifts with variable colours may eventually help boost sales as well. Some people may be attracted to the different colours and unable to make up their mind as to which colour to purchase. Hence, they may end up getting all the different colours! Wouldn’t this marketing strategy help pull in sales for you? Branding is crucial in increasing brand awareness for your company. By including your company brand logo on the promotional gifts offered, it can act as free walking advertisement for you as well. When your consumers carry these clutches out, other people would be able to notice your brand name that is branded on it. Brand loyalty may also be built in the long run. Therefore, remember to brand your logo on the promotional gifts before considering giving out to your consumers!